It's time to take another look back at the X-Men comic book franchise for the year that was 2010. 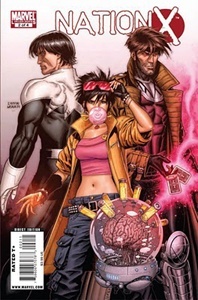 There were a lot of changes and many ups and downs as would be expected for group of books about mutants. 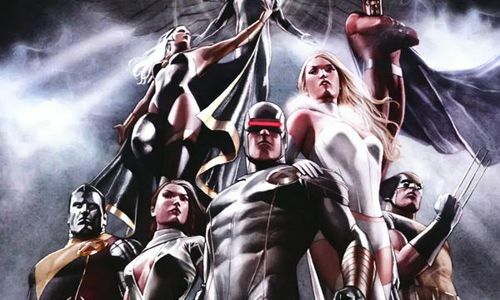 In this installment, I take a look at Astonishing X-Men, the new adjectiveless X-Men book, and the seemingly endless stream of anthologies that came out this year. Oh, what a fustercluck of scheduling that is the Astonishing X-Men books. 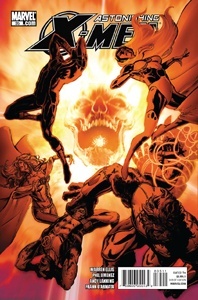 According to writer Warren Ellis, “Xenogenesis” was supposed to be the next story after the “Ghost Box” arc in Astonishing X-Men, but he had to throw together the “Exogenetic” story to kill time before “Xenogenesis” was ready for publication. Then “Exogenetic” began running late and issues of the third storyline (originally intended to be the second) started hitting the stands before the second arc (which was really a place holder for the third arc that was meant to be the second) was able to finish. Whew! At least, Warren Ellis put the blame squarely on his own shoulders. He admitted to a bit of burnout, so I admire the fact that he came clean. The wrap up to “Exogenetic” in Astonishing X-Men #34 and #35 was extremely lackluster. The X-Men flew their plane into the gigantic lair of a mad scientist and had a conversation… which is exactly how “Ghost Box” ended. What made the ending even sillier was the motivation of the villain: he was horribly deformed by his mutation and he attacked the oh, so pretty X-Men out of jealousy. At least the art by Phil Jimenez and Andy Lanning was fantastic. The story in Astonishing X-Men: Xenogenesis has been more focused, though tapping into some two decades old Captain Britain plots. Unfortunately, the art by Kaare Andrews hasn’t done the book any favors. I don’t mind exaggeration and artistic license, but Andrews’ Emma Frost is pretty obscene. I don’t particularly care for Ellis’ handling of the character either. Yes, Emma is bitchy and a snob, but she’s not one to go around kissing everybody so she can telepathically read them. It’s no mystery why the fourth issue of the series was the best: very little Emma. I’m really ready for Astonishing X-Men to go away. With the new adjectiveless X-Men providing less continuity-beholden stories for the fair-weather X-Men fans, Astonishing isn’t really needed anymore. Unfortunately, Astonishing X-Men will continue next year with an arc written by Daniel Way. 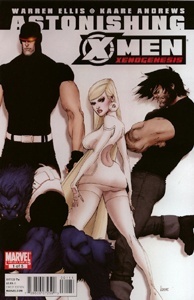 The X-Men versus vampires. Why not? Apparently, vampires are sooooo hot at the moment and Marvel wants to cash in by having everyone’s favorite mutants go head-to-head with a whole mess of them. To be fair the new adjectiveless X-Men series is pretty new-reader friendly and is supposedly the book where the team will rub elbows with the wider Marvel Universe. So far, it’s doing a better job at it than Astonishing X-Men has in the last couple of years. Victor Gischler has been able to write the various X-Men in this book capably and convincingly. Also, his revamping of the Marvel vampire mythology has been pretty interesting. Hell, this is the most action Jubilee has seen with the X-Men in a long time (she did get a brief moment in the sun as Wondra of the new New Warriors not too long ago). Now that she’s a vampire instead of a depowered mutant, there is plenty of story potential to mine. 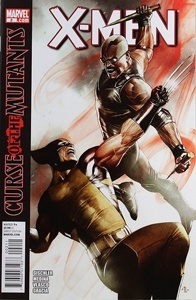 Still, the whole affair went into a bit of a nosedive with the last two issues of the “Curse of the Mutants” arc. Cyclops was able to un-vampirize Wolverine with a garage door opener. This was enough to completely demoralize an entire army of vampires, allowing the X-Men to stomp them into soil of Utopia. The final chapter was more about Dracula reclaiming his throne and ended with Cyclops bluffing the vampire lord into going away. The art by Paco Medina has been consistent and solid throughout. However, he has the tendency to get a little cheesecake on the page more often than I care for. Apparently in Medina’s world, all teenage girls have very pronounced, perfectly round bosoms. Maybe it’s part of their mutations. Maybe it’s just the hormones fed to cows to increase milk production that got into their dairy growing up. Who knows? Make these stop. Please. Seriously, stop them now. The Rockslide and Anole story in X-Men: To Serve and Protect has been fun, but it’s a multi-parter and it’s written by Chris Yost, who wrote the pair in New X-Men. In the end, these are basically tryout books for newer writers and artists and an opportunity to get more cash out of X-Men fans that can’t say “no”… like me. Next time I'll review what happened with various Forever books that came out in 2010.